Ahh Frozen! Who doesn’t love the film? It’s on most days when my daughter is at her Grandma’s house! Baby girl absolutely loves it, much to my husband’s annoyance! She loves to dance and sing ( in toddler speak!) to it. 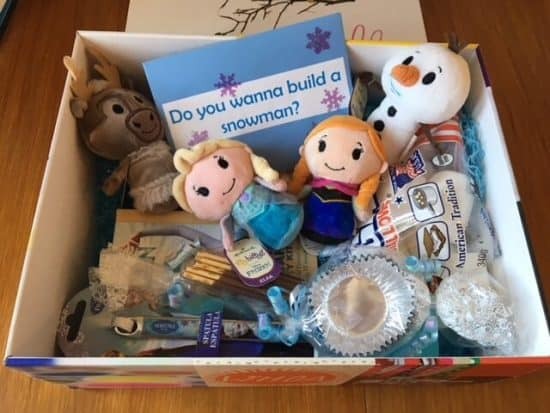 When we were challenged to build a snowman from Hallmark to celebrate the new Itty Bittys collection it was a little exciting! 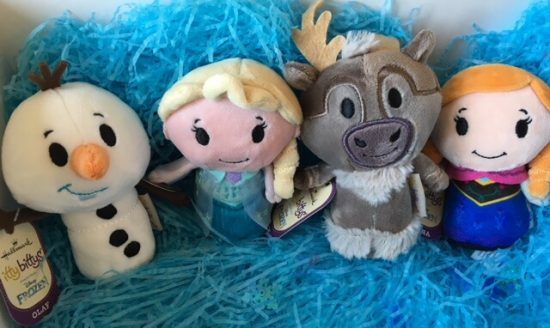 Hallmark have released a fantastic Frozen collection featuring Anna, Elsa, Olaf and Sven – all the fan favourites. In our goody box from Hallmark was a whole host of delights. As well as the four Itty Bittys there was a couple of celebration cards – Frozen of course! 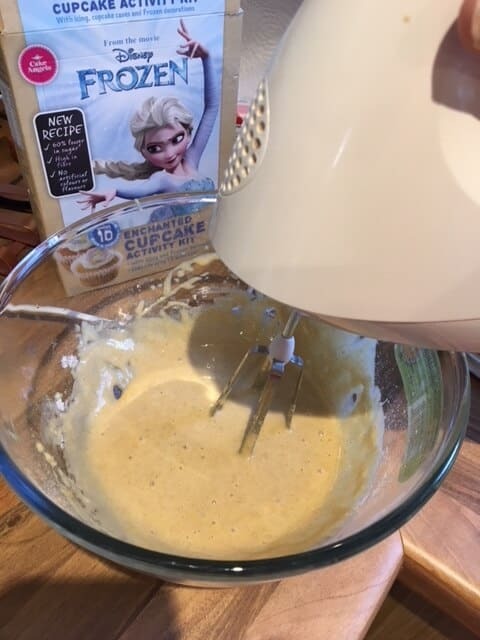 a Frozen cupcake kit, and all the ingredients to make your very own snowman. The Itty Bittys are extremely cute, they would make ideal Christmas gifts. 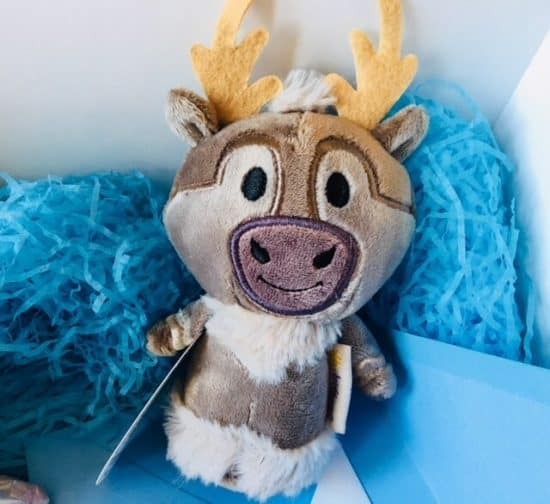 Our favourite is Sven he is adorable. All of the Itty Bittys are perfectly made and very detailed. This past week we have been busy in the kitchen baking the cupcakes. Baking is something I love to do with baby girl and can’t wait to do more of it. 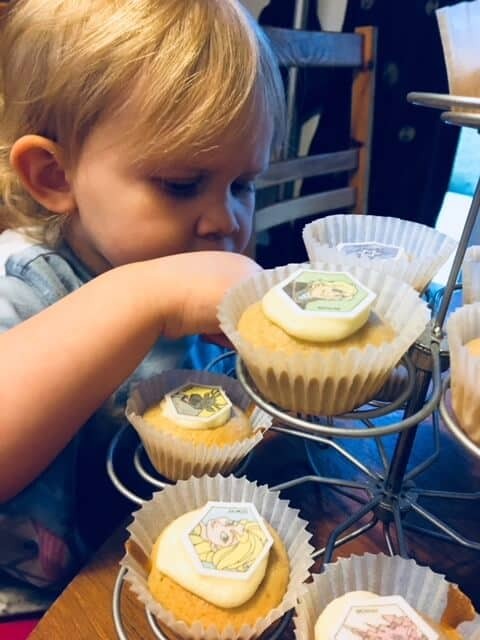 At 21 months she is still quite small, plus finds it hard to sit still long enough, but she loved putting the toppers on the cupcakes. After the cupcakes were made it was time for ” Do you wanna build a snowman?” This was great fun! 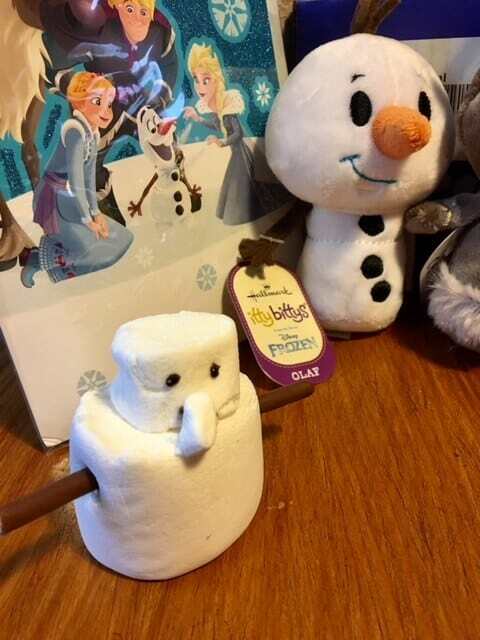 We got the large marshmallows and cut the bottom quarter off – this is for the snowman’s head. To make it slighter smaller roll it between your fingers and it will squish down. The larger part of the marshmallow is the body. We used the chocolate biscuit sticks broken in half for the twig arms. Black icing was used for the eyes and for the buttons (which we forgot to add!) Sven’s tooth was a baby marshmallow although it kind of looks like his nose! We were extremely happy with our attempts at building a snowman. Thanks Hallmark for the challenge. If you wish to buy your own Itty Bittys you can do so here on the Hallmark website. They also do a range of other Disney Itty Bittys. Thanks for stopping by today I hope you enjoyed our post.